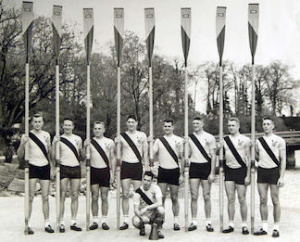 Robert Detweiler was an Olympic gold medalist in rowing. He and his American team won gold at the 1952 Helsinki Summer Olympics. Detweiler was born on July 20, 1930, and grew up in Ziegler, Illinois. He attended the U. S. Naval Academy where he became a member of the school’s rowing team. The team, known as the “Great Eight” were undefeated. He was a colonel in the U.S. Air Force and earned five Distinguished Flying Crosses, the Legion of Merit, and the Distinguished Service Medal. He had a career as a nuclear physicist and was named “The Most Outstanding Military Scientist” in 1965. He served as the director of research for energy and communications at the Eyring Research Institute. He was musically talented—he sang with the Salt Lake Opera Company, served as chairman of the Utah County Arts Council, and was a founding member of the Utah Piano Quartet. Detweiler joined The Church of Jesus Christ of Latter-day Saints after the olympics. He married Donnell Brown in the Idaho Falls Idaho Temple. He passed away on December 8, 2003. This page was last edited on 29 December 2016, at 14:21.